Last summer’s horrific crash near Fort Totten revealed a colloquial term for the emergency brake aboard all trains: the Mushroom. 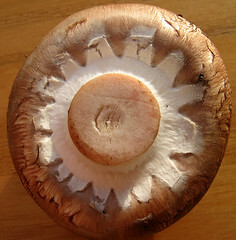 Named for its shape, the Mushroom engages the emergency brakes and brings the train to an immediate halt. Yesterday, Metro reported an incident involving the emergency brakes being engaged on a Red Line train at Forest Glen as it approached the Station. No one was injured, but it’s concerning to hear that so long after last summer’s crash, that perhaps the system’s train indication still isn’t working. This was one of our questions for interim GM Sarles at the blogger roundtable that was supposed to happen late yesterday. We were told that GM Sarles had a meeting late in the day with Congress and that was why our meeting was delayed, but the timing here could be considered suspect. The questions remain: What state are the train detection circuits in on the Red Line? It certainly is not promising to hear that the emergency brake was deployed here in light of what we’ve been promised. We’re hoping that the roundtable will be rescheduled for early next week, and we can find out ourselves.